1. Tightly cover a large, heavy chopping board or a baking tray with clingfilm or baking parchment to place the truffles on to set. Place the chocolate in a large mixing bowl, at least 1.75 litres in capacity. 2. In a small pan, bring the cream to a rolling boil and immediately pour onto the broken chocolate. Blend thoroughly with a wooden spoon until smooth and all the chocolate has melted. 4. When the ganache has set, use a teaspoon to scoop out bite-sized pieces. Dust your hands lightly with cocoa powder or icing sugar to prevent them sticking and roll the pieces into balls in the palms of your hands. 5. 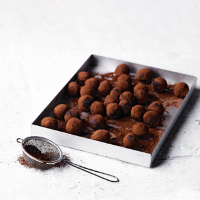 Immediately roll the truffles in sifted cocoa powder, icing sugar or finely chopped nuts, then place on the board or tray and chill in the fridge until set. For milk or white chocolate truffles, simply replace the plain chocolate with milk or white chocolate. For alcoholic truffles, add 75ml rum, brandy, Calvados or any other alcohol you like to the ganache before allowing to cool and set. This recipe was first published in Wed Feb 05 11:12:57 GMT 2014.